Full Cover False Nail Tip With Printed Art. Material: Good quality, tough plastic. Size of nails are rang from NO. : 0 to NO. : 09, the number was marked on the back side of each tip. Minimum Length: 1.5CM. 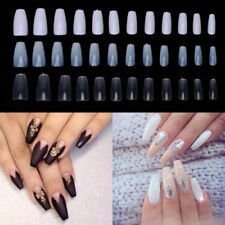 500 Natural long oval full cover false nails. 500 Long oval. Size: 0 13mm wide - 28mm long. Size: 1 13mm wide - 28mm long. Size: 2 11mm wide - 27mm long. Size 3: 11mm wide - 26mm long. Size 4: 10mm wide - 25mm long. Stunning French nails that give a look of atop notch salon nails (or even perfectly manicured natural nails). Gently push back cuticles, clip your nails and file them. Ifyou wish false nails to stay on longer, you can gently buff the surface of yournatural nails. 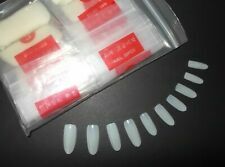 This is a set of finished false nails, 24 pcs per set, with 11 different sizes to fit various finger nails. The false nails are with back glue sticker, you can stick them to your nails within 3 minutes. Can chop / cut to any style you like. 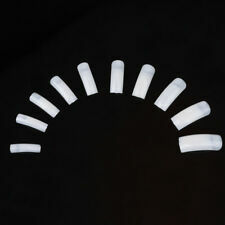 Suitable for nail extension with nail art decorations, Acrylic, UV Gel, Fiberglass and Silk applications. For your professional nail extension and French nail making. 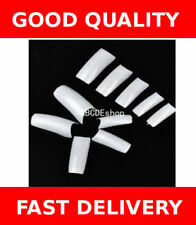 Full Cover False Nails, White. You will receive: False nails x 40. - The largest nail - size 0 - is 15mm wide and 27mm long. Please note: The glue may be dry so we will include some extra glue just in case. 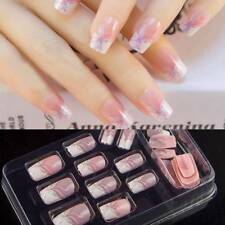 24 False Nail Nail System French Manicure Pink * 24 Nails. Design your own nails for wedding, party or weekend dating. Nail Length: approx. 2-3cm (Min-Max). Nail Width: approx. 0.7-1.5cm (Min-Max). Suitable for use with gel, acrylic or fiberglass applications. Full Cover False Nails, Dark Blue. You will receive: False nails x 40. - The largest nail - size 0 - is 15mm wide and 27mm long. For professional natural nail extension. Perfect for creating a special false nails by yourself. Color: Natural. What is in the box. Great Gift.